Description: This marker memorializes the service of the paratroopers of the 4th Battalion 325th Airborne Infantry Regiment of the United States Army. The memorial is made of a slightly slanted slab of granite, approximately four feet long by two feet high and two feet deep, and is engraved on the front face. The engraved text is framed on the left by the "AA" ("All-American") insignia from the shoulder patch of the 82nd Airborne Division. And it is framed on the right by the insignia from the patch of the 2nd Brigade Combat Team of the 82nd Airborne Division, known as the "Gold Falcons". The insignia engraved at the top of the marker represents the U.S. Army Master Parachutist Badge. 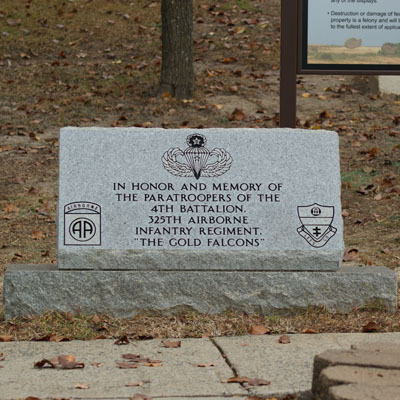 IN HONOR AND MEMORY OF / THE PARATROOPERS OF THE / 4TH BATTALION, / 325TH AIRBORNE / INFANTRY REGIMENT, / "THE GOLD FALCONS"
Post dedication use: The memorial site next to the 82nd Airborne Division Museum has been the site of annual services to honor fallen paratroopers and their families. On May 19, 2011, the names of more 200 fallen paratroopers were read during the services for All-American Week. I did the jump onto Omar Torrijos with Bravo co. The first combat jump for the 82nd since WWII but the first ever combat jump for the 325th. I'm proud to say I was part of that. It was heavy and constant fighting for the first three days. No one ate or slept the entire time. It's a good thing we were young and full of energy. When we jumped, you could see the tracers flying. Fortunately, no one was shooting directly at me. When I landed and began putting my M60 into action, I was still not being engaged. I never even fired a round until we hit Fort Cimarron. Also - that is not just a Master Parachutist Badge - it has a star in the risers, making it a Combat Parachutist Badge as well. Thank you very much for visiting NCpedia and especially for sharing your service and this additional information. We very much appreciate you adding this context to the entry about the marking.